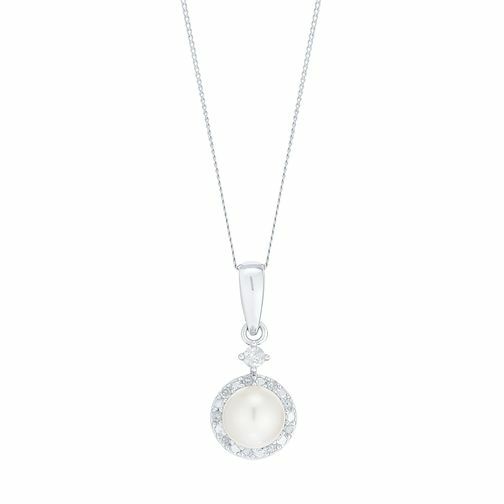 This elegant 9ct white gold pendant is adorned with a shimmering cultured freshwater pearl, surrounded by a pretty halo of delicate diamonds. Finished with a fine chain to complete the feminine feel of this versatile piece. 9ct White Gold Cultured Freshwater Pearl & Diamond Pendant is rated 2.5 out of 5 by 2. Rated 1 out of 5 by Anonymous from It's so small and looks cheap The size of it is really small and it looks super cheap I'm not one to hate on the products the shop sells I buy every thing from here bit this is the first time in truly disappointed in the piece of jewellery I have brought.